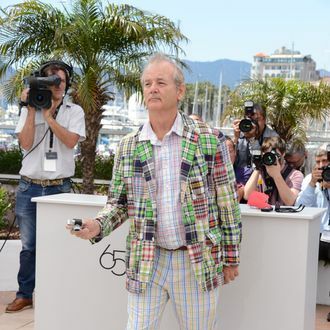 It is a known fact that no party really starts until Bill Murray does his thing. That proved to be as true in Cannes as it has in Austin bars and Manhattan karaoke parlors. Though lovely and on the beach, the post-premiere soiree for Wes Anderson’s Moonrise Kingdom was proving a bit of a snooze. For at least an hour after his arrival, Murray sequestered himself with the other adult cast members (including Tilda Swinton and Jason Schwartzman) in a crammed and impenetrable VIP area. (Vous ne pouvez pas passer!) The film’s real stars, a crew of 12- and 13-year-old boys, seemed to be enjoying themselves more, having played a massive game of hide and seek. They had to quit, though, when one of their members went missing for half an hour. They were also looking to dance, and they knew whom to look to. At the request of Gilman, who just had his bar mitzvah and has a taste for dub-step, Bill Murray led the troop onto the dance floor, where the four kids and their accompanying man-child wiggled and jumped around with abandon. It was a scene of such next-level adorability that nearly everyone in the immediate vicinity pulled out a camera phone. “We’re just chilling! We’re just chilling!” Murray shouted out as he put the kibosh on each video in turn. Then he’d go back to more happy wriggling to songs like “I’m So Excited.” Every time a female fan would come up and try to dance with Murray, he’d make her take one of the boys as a dance partner, as if chaperoning a middle-school mixer. The big moment, though, was when Murray decided everyone should link arms and dance in a circle. The song was Hava Nagila-ish, though just as I was trying to find out the name, I felt a tug on my arm. It was Murray. “Can you be a girl?” he asked. Could I ever! He sandwiched me between Seamus and Gabriel, showed them how to put their arms around my shoulders, and then went off to find more recruits. “Boy, girl, boy, girl,” he instructed. Swinton joyously jumped in, as did longtime Wes Anderson friend Waris Ahluwalia. Soon the circle was at least twenty people deep. And we were off! We circled one way, then back the other way, doing alternate forward high kicks at a ferocious speed. “Kick higher! You have to kick higher!” Murray instructed. We kicked higher. And higher. And circled more and more, and all ran toward the middle and then all ran away. By the time the song ended, there wasn’t one among us who wasn’t exhausted and beaming. Seamus and Gabriel gave me high fives and told me that that had been better than chocolate, if such a thing is even possible. Murray seemed pleased. He’d just helped a roomful of jaded Cannes partygoers remember what it feels like to be a kid.